Marilyn Jean Jackson of Lisbon, Ohio went home to her Lord on March 3, 2018. She was born in East Chicago, Indiana on April 8, 1933 to Ralph S. and Stella Irene (Thomas) Bartley. She graduated from Youngstown North High School and on March 1, 1952 she married Paul Edwin “Ed” Jackson. During their 40-year marriage, they raised their eight children, instilling in each of them the value of faith, family and hard work. Marilyn had a long and varied career as a healthcare giver, but her greatest passion was providing long-term, in-home care for the ailing and elderly. Music and church were a big part of her life. 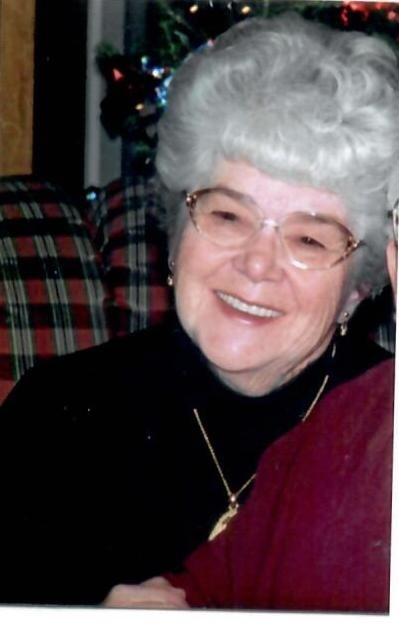 She loved to sing hymns and was a long-time member of the Lisbon Assembly of God Church and a regular attendee of St. Jacob’s United Church of Christ. Marilyn will be lovingly remembered by her eight children: Sheryl (Curt) Bacon of Marion Ohio; Joyce (Richard) Jackson of Salem; Paul E. Jackson, Jr. of Lisbon; Donna (Jeffrey) Shuman of Lisbon; Ronald (Linda) Jackson of Lisbon; Sandra (Brian) Williams of Lisbon; Karen (Jay) Swetye of Salem; Kenneth Jackson of Lisbon; her “adopted” son Lee Huffman of Lisbon; 17 grandchildren; 36 great-grandchildren; her companion of more than 20 years, Charles “Red” Esenwein of Leetonia; her sister, Lianne Brown of Missouri; and her cousins Terry Hogue and Bob Logan of Canton Ohio. In addition, she is a beloved aunt to four generations of nieces and nephews. She was preceded in death by her parents; her husband Ed; two brothers, Jack Bartley and Melvin Bartley of Orange, Texas; and great-grandson, Kelian Redmond of Salem. Marilyn was a tireless worker, a wonderful cook and baker who kept her family fed and still managed to share meals with those who were less fortunate. She was a reader of stories, a teacher of Jesus who scrubbed and dressed eight children in readiness for Sunday School every week, a singer of songs, a supportive and loving wife, a lover of spring flowers, a creator of magical Christmases, a planner of adventures, an enthusiastic traveler and a fisherwoman who took great joy in landing the biggest catch of the day. She was a blessing and comfort to those who knew her, a generous woman who put the needs of others before her own, a woman with deep and abiding faith who never doubted the saving grace of Jesus and rejoiced in the mystery of holy scripture. She was a mother, grandmother, sister, friend and companion who will be dearly missed. The family would like to extend a special thank you to the Emergency Department staff of Salem Regional Medical Center, the staff and doctors of the CICU and Floor 6 of St. Elizabeth hospital, the staff of Poland Shepherd of the Valley Rehabilitation and the nurses and aids of Hospice of the Valley for their care, kindness and support. A Memorial Service and Celebration of her life will be held at Lisbon Assembly of God Church, 39442 SR 517, Lisbon, Ohio on Wednesday, March 7, 2018 at 12:00 noon. Family and friends are invited to a visitation at the church two hours prior to the service from 10:00 am to 12:00 pm. Arrangements have been entrusted to the Weber Funeral Home.